Tim's latest book is superb. It's not going to win a Pulitzer, and it ain't literary genius...but it is a superb book. One thing that Tim does extraordinarily well (almost annoyingly so) is synthesize information. He did it in the Four Hour Workweek (a must-have for anyone in business), and again in the Four Hour Body and Four Hour Chef. In short, Tim's books sometimes make me want to stop writing because he has that uncanny knack of writing just what you had wanted to write....but more importantly what you needed to read. In Tools of Titans, Tim summarises some of the key learnings and most pertinent quotes and concepts from the various influencers ('Titans') that he has interviewed on his podcast. The list of influencers is quite extraordinary (e.g. Laird Hamilton, Dom D'Agostino, Peter Attia, Tony Robbins, Rick Rubin, Peter Thiel and so many more), and the tips and lifehacks you can gain from this book are immense. I read it through, taking only sparse notes, and immediately felt like a lot of the information in the book had already changed my perspective on life, which in turn had a BIG effect on my personal happiness, productivity, and wealth generation. 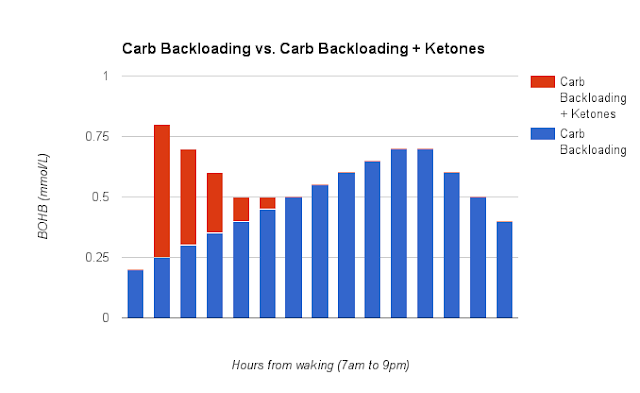 You can see that in the morning, after a hefty dose of carbs the night before, I would usually be around 0.2 (or sometimes up to 0.4) mmol/L of betahydroxybutyrate (the primary 'fuel' ketone). This gradually rises over the day reaching what is commonly called 'Nutritional Ketosis' (NK), a level of more than 0.5mmol/L BOHB around lunch time and steadily increasing until I start to get down with my bad self and eat (protein) cookies, milk and cornflakes. (Yes- you read that right. Don't be a hater). Higher BOHB is going to mean more fuel for my brain and more for training. It's also incredibly satiating, and while I don't have a problem with over-eating, satiety inducing tools help me to eat well during the day...specifically so that I can have a treat at night. Have your cake and eat it too? Yep. I do. Note: As I mentioned last time, everyone is different. Carb-backloading doesn't work for everyone, but behaviourally and functionally (for cognition, mood, and performance) it works for me.